In 2017, the average consumption of poultry in Poland was 29 kg a year per capita. Not many consumers eat poultry from their own farms. We usually buy it in shops. The trip from the farm to the slaughterhouse is highly stressful for the poultry. Birds die, lose weight, are injured and, additionally, as a result of stress, their meat becomes watery or hard. Carcasses are battered, therefore their value decreases. These are losses for farmers, merchants and consumers. Prof. Anna Wójcik from the Department of Animal and Environment Hygiene in the Faculty of Animal Bioengineering has been conducting research on pre-slaughter stress in poultry for many years. “Poultry stress can be limited, e.g. by administering mineral or vitamin preparations, but sedatives cannot be used,” Prof. Wójcik explains. Prof. Wójcik, with her team, composed of her Department members: Prof. Janina Sowińska, Tomasz Mituniewicz, PhD, and Dorota Witkowska, PhD, together with Janusz Pomianowski, PhD, Eng. from the Department of Commodity Science and Food Analysis in the Faculty of Food Science, decided to find not a chemical preparation, but a natural, plant-based one. 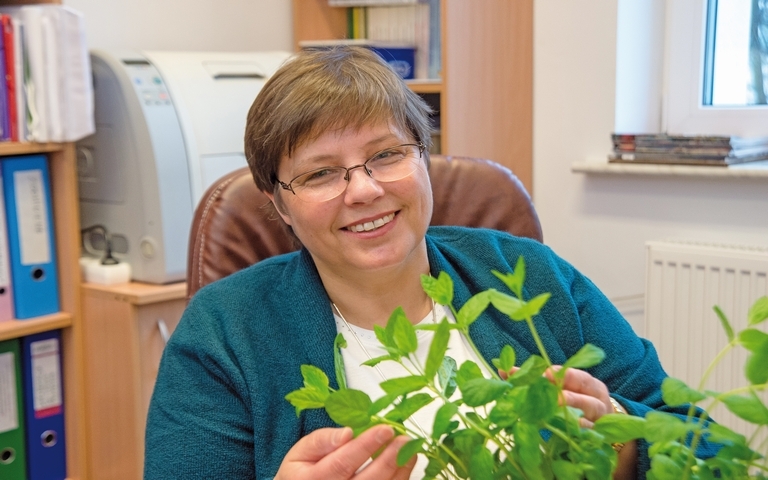 The scholars from Kortowo started their research with lemon balm, known for its calming effect. They also focused on little known galega. This herb, among its other properties, regulates blood glucose level, preventing deterioration of meat quality. Other herbs they were interested in included stinging nettle and garden sage. “Our research assumptions proved correct. The preparation is effective. It should be administered for 7 days before the transport. The meat of poultry provided with herbal mixture is fit for direct consumption, as the mixture does not have any side effects and nothing accumulates in the poultry body,” Prof. Wójcik continues. In January 2017, her team was granted a patent in the Patent Office. What are the next steps? “We did not go beyond the experimental phase. We don’t know the costs of producing the mixture. Since in Poland there are a lot of companies manufacturing herbal mixtures for human use, I believe that it should not be more expensive to develop production technology for our preparation. The herbs we used are common and they are grown in Poland,” Prof. Wójcik concludes.